In a state that boasts vast open prairie spaces, attending criminal justice school in Kansas can give students a look at both urban and rural crime fighting and prevention. From metropolitan police forces to law enforcement protecting parks and natural ecosystems, Kansas employs over 35,000 professionals in legal and protective service fields associated to criminal justice. This page explores the best criminal justice schools, the variety of degree programs available and includes stats and information on some of the potential careers students can seek after criminal justice school in Kansas. After Criminal Justice School in Kansas: What's Next? Many factors determine the best criminal justice schools in each state. For Kansas, this list ranks some of the most important factors for students - like cost, enrollment and student-to-teacher ratios - to rank each criminal justice school in Kansas from top to bottom. Check out the stats each school provides below. Corrections, police science and victims services are among the criminal justice offerings at Kansas City Kansas Community College. The college is home to the Workforce Career & Entrepreneurship Center, and students have access to a long list of academic resources. Free tutoring is available, as is assistive technology for students with disabilities. Other services include health and wellness programs, and access to the Academic Resources Center, which offers students resources to strengthen their skills and graduate on time. There is also a counseling and advocacy center, career services and a child care center. Students at Labette Community College can take daytime classes, evening classes and online classes in pursuit of a criminal justice degree or a degree in corrections, probation and parole. Both are associate in science degrees that prepare graduates to work with juveniles and adults in careers include police work and corrections. All students will have access to helpful services. The Student Success Center includes a computer lab and testing facilities. Academic services include peer tutoring, supplemental instruction labs, and help from math and English specialists. All tutoring is free, and students can also take advantage of the school's career services. Criminal justice students at Seward County Community College and Area Technical School can pursue degrees in community corrections, fish and wildlife, and law enforcement. The college's library is home to more than 30,000 books, 190 magazine subscriptions, 22 newspaper subscriptions and many journals and articles. Statewide articulation agreements make it easy for students to transfer eligible credits to senior institutions across Kansas. Students will also have access to the services of advisors and counselors. The school achieved accreditation with the Higher Learning Commission through an alternative route called the Academic Quality Improvement Program (AQIP). There are two different degree options for criminal justice students at Hutchinson Community College. The first is an associate of applied science degree, which is designed for students who have already been certified by a law enforcement academy. The other option is an associate of science degree, which is designed for students who plan to further their education with a full four-year degree. All courses for both degrees are now available online for distance learners. Academic resources, which are available to all students no matter the path they choose, include tech support, the Student Success Center and the JFK Library. Criminal justice students who plan to transfer to a four-year university and achieve a full bachelor's degree after they graduate from Highland Community College can pursue an associate in arts degree. For those who want to enter the workforce right after graduation, Highland offers an associate in applied science degree. Graduates will be qualified to begin work in the courts, in corrections, in police departments and highway patrol agencies. Student services include counseling and crisis intervention. Students also will have access to IT support and academic advising throughout their time at the college. The criminal justice program at Southwestern College teaches students about the theories, concepts, laws, procedures, statutes and methodologies that make up the justice system. The college has partnered with Point Loma Nazarene University for a comprehensive baccalaureate program in criminal justice. Career options exist for students obtaining an associate degree, a bachelor's degree and a graduate-level degree, including law enforcement, corrections officers, bar examiner, district attorney, forensic scientist, FBI/Treasury, Secret Service agent, U.S. Marshal, etc. The police academy program at Southwestern takes approximately ten and a half months to complete and is comprised of two phases. Classes take place during weekday evenings and Saturday mornings. Students pursuing a Bachelor of Science degree in criminal justice at Washburn University in Topeka, KS, can expect to choose from four areas of concentration including law enforcement, corrections, security administration or forensic investigations. Two-year plans include associate degrees in both criminal justice and legal studies. Students who wish to pursue a four-year degree plan can choose corrections, law enforcement, forensic investigation, security administration or legal studies. Washburn University offers student activities for criminal justice majors, including access to the Criminal Justice Association and the Kansas Correctional Association. Scholarships may be obtained for exceptional and qualified students, along with other various financial aid options. The criminal justice program at Newman University exposes students to coursework and hands-on learning, including field trips and mock crime scenes. Faculty advisors work to place students in co-op opportunities to help them immediately find careers upon graduation. Other students can choose to pursue graduate degrees in criminal justice, social work, public administration and law. Career options for the bachelor of science in criminal justice graduates include working in the court system, government, correctional facility, juvenile detention center, police officer or sheriff. Students can also get involved with The Justice League, a campus club for criminal justice majors. Wichita State University's criminal justice program began in 1934 as a police program, and was the fourth institution to also offer coursework in political science. Wichita State offers both undergraduate and graduate programs, and courses are taught in both classroom/face-to-face settings and online. The undergraduate program consists of 36 hours and provides students with a comprehensive overview of the criminal justice field and prepares students for careers in law enforcement, corrections, law. The graduate program focuses on criminal justice system practice, theory, policy making, etc. Wichita State University does offer 100 percent online programs to students pursuing criminal justice in both undergraduate and graduate degree programs. Criminal justice majors at Kansas Wesleyan University prepares students for careers in the following fields: judges, city prosecutors, practicing attorneys, investigators and police officers. Kansas Wesleyan offers both online degree and hybrid course schedules, which gives students the option of choosing to complete programs completely online or a combination of online and classroom settings. There are three different areas of concentration for criminal justice programs: domestic violence endorsement, law enforcement endorsement and offender management endorsement. Independent studies, individual research projects and internships are some of the real-life applications students will be exposed to at Kansas Wesleyan. In addition, students typically finish high in law enforcement academies upon graduation. 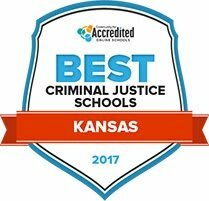 With a variety of acceptance rates, costs and other differentiating factors, criminal justice schools in Kansas are as unique as the programs they offer. Students can search these schools with the tool below to pinpoint and compare the different degree levels, program costs and student experiences at various educational institutions within the criminal justice realm. Kansas employs a range of people across the criminal justice field, from deputies and patrol officers to forensic scientists, paralegals and trial attorneys. Scroll over the boxes below to check out the most popular career paths for people interested in criminal justice in Kansas. These common careers include state-specific employment and salary statistics, and the degree requirements for each field in Kansas, which can be a good way to for students to check the level of education they need before pursuing a criminal justice degree. As students consider attending criminal justice school in Kansas, they should also consider the cost of living in the state, and the return on investment a criminal justice degree can bring in the state. The graphs below pinpoint several careers that students in criminal justice school may consider pursuing, with detailed information about the average salary and job growth projections in Kansas compared to the national average. Each occupation also includes details about the minimum education requirements for Kansas students. For criminal justice program graduates, it may be difficult to decide where in Kansas they can do the most good and meet their career and salary goals. The chart below explores the cities and regions of Kansas that employ criminal justice workers and how their wages vary by their employment location to help interested graduates see which parts of Kansas are most in need of protective service or legal employees. Operating in Kansas City and serving Kansas and central to western Missouri, the ACC Mid-America Chapter is a membership organization for business legal counsel professionals. This site includes important regulatory information on starting, maintaining and operating a business in Kansas. The BBB sets and maintains standards for businesses and charities, and provides a wide range of information, including reviews, reports, directories and listings in Kansas. A site for registering a business and paying taxes, as well as answering questions on other business tax-related topics. As a division of the Kansas's environmental health department, this body supervises several aspects of environmental education in Kansas and provides ombudsman services for any small business queries about who to contact in the Department of the Environment. A professional group comprised of correctional professionals in Kansas, the mission of this association is to advance the correctional process for both youth and adult offenders in the state of Kansas. With informational resources on inmates and new policies and procedures as well as employment information, this website has all public information about Kansas' correctional facilities, community resources and contacts. A community group supporting prison rehabilitation programs in Kansas, ROFW provides programs designed specifically to help improve inmate behavior while still in prison with their "Courage to Change" movement. The primary program for probation services for the State of Kansas, KASCO's programs include adult and juvenile parole and probation, domestic and child welfare services. A membership group for professional court reporters in the state of Kansas. Learn more about the profession and search careers on this page. A resource for finding Kansas City, district, appellate and supreme courts, court records and personnel and job application information. Links to appellate and bankruptcy courts; Kansas district, state and local courts; laws and regulations; lawyer resources; state agencies; and various departments that may assist with legal education opportunities or other general information. District court information for Kansas, from forms, judges and rules to information for attorneys or those interested in self-representation. This branch of the national protection group has information on current events, local issues and civil liberties cases in Kansas. A local branch of the National Association of Legal Secretaries, this professional group is based in Kansas City and promotes a high degree of professionalism amongst legal support workers in the state. They also provide a scholarship program. A statewide non-profit working to help low-income Kansans with legal and mediation services. There may be legal aid resources for major cities or various counties in Kansas, such as Douglas County, that interested parties can investigate. Use this website to find out more on becoming a lawyer in Kansas, as well as find continuing legal education resources and community engagement programs. This department employs special agents, forensic scientists and clerical workers to collect and disseminate high-quality evidence analysis and crime data. Supporting correctional and law enforcement professionals in Kansas, the KGJA is a group for criminal justice professionals working to combat the rising number of gang related crimes in the state. A combination of the Kansas D.A.R.E. program and Kansas School Resource Officers Association, the KJOA works with the Kansas Juvenile Justice System, juvenile courts and corrections and school law enforcement. This organization seeks to create a community among Kansas peace officers, advance criminal justice sciences and encourage development and improvement in law enforcement standards. Part of a movement to educate and train first responders to safely engage with individuals experiencing mental health crises, reducing the risk of escalation and violence. Information on basic training as well as continuing education, upcoming events and further resources for law enforcement personnel. From wildland to community fire inspection and investigation, the KSIAAI focuses on fire-related issues in the state of Kansas, and provides training and scholarship programs for students. An informational resource on hunting, fishing, boating, camping and other outdoor activities. There are links to resources about licenses and education and employment opportunities. This site has information on hunting and fishing in Kansas’ national wildlife refuge. It also has a page on employment as a Federal Wildlife Officer. A local affiliate of the National Wildlife Federation, the KWF is an advocate for wildlife, sportsmen and environmental managers across Kansas’ ecosystems.